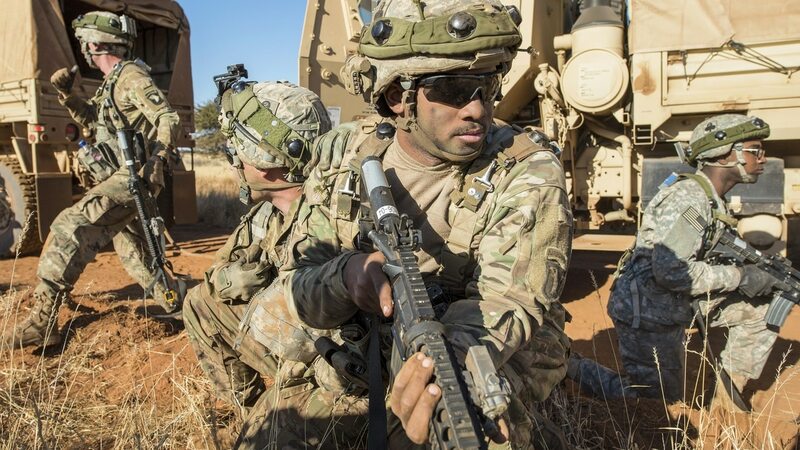 For years, U.S. Army Africa has hosted hundreds of civil affairs and Special Forces troops in a bid to build security and deter extremist groups in the region. Their work, particularly in countries like Cameroon, Niger and Mali, remained largely unknown, taking a back seat to news about ongoing operations in Iraq and Afghanistan. But the Army’s missions in Africa were pushed into the spotlight Oct. 4 when four soldiers from 3rd Special Forces Group were killed in an enemy ambush in southwest Niger. A day after the attack, Army Times spoke to acting U.S. Army Africa Commander Brig. Gen. Gene LeBoeuf about focusing on West African extremist groups and bumping up exercises with African partners. A joint American and Nigerien patrol came under hostile fire in southwest Niger, according to LCDR Anthony Falvo, a spokesperson for U.S. Africa Command. USARAF and its local partners completed 186 theater security cooperation events in fiscal year 2017, LeBoeuf said, and there are 271 on the agenda for the next year. LeBoeuf, previously USARAF’s deputy commanding general, took over the command in late August, after his predecessor was suspended amid a misconduct investigation. The head of U.S. Army Africa has been suspend from his post in Vicenza, Italy, after Facebook messages surfaced of his flirtatious conversations with one of his soldier’s wives. That hiccup hasn’t slowed down the command, LeBoeuf said. Q. Where are you focusing on in terms of exercises and forming partnerships? A. So we are spread throughout. We like to rotate our exercises among east, west, north and south and central Africa, if you will. That is purposeful in terms of ensuring that we have an opportunity to engage with partners across the continent, and we are not just focused on one particular region. Our exercises themselves actually are going to be across a swath of Africa for fiscal year 2018 as well. And that is going to include Justified Accord that is going to take place in Uganda; Unified Focus will be Cameroon; we will also have an exercise in Ghana and also an exercise in Rwanda. In addition to that, we will have five different medical exercises that are going to go on. I do want to focus on where we are shifting our focus here on the continent itself. Even though we have dispersion across the different regions I just described, we are also now moving from 2017 and our successes there to recognizing that there are some additional challenges in the Lake Chad Basin Area. So, approximately 80 percent of our theater security cooperation activities are going to be focused in Niger, Nigeria, Chad and Cameroon area for next year. That is a significant increase from what we had over the past year itself. Those, I would say, are our focus areas, if you will — the Lake Chad Basin area, and the different exercise hosting nations as well. Q. Why is the Lake Chad Basin such an important area? A. There are a number of focus areas, really — reasons, I should say — that we are looking at the Lake Chad Basin. One is what is happening to Lake Chad. We are seeing, right now, Lake Chad is about 10 percent of the size that it was in the 1960s. That is a significant reduction in the size of a very large lake and fresh water source for those four countries of Cameroon, Niger, Nigeria and Chad. We also see in that area a great number of displaced personnel and even refugees that are crossing the borders. Not tens of thousands or hundreds of thousands, but millions of people in the Lake Chad Basin that are displaced, or refugee populations that are very susceptible to a number of different influences. Then we see a growth of violent extremist organizations in the area as well, such as Boko Haram. It is one of our efforts with [U.S. Africa Command] to address violent extremist organizations, to help our African partner nations be able to equip and be prepared to address the violent extremist organizations operating in that area. It’s counter-IED, medical, logistics and also mission command — those are the four areas that we primarily focus on from our host nation, our partner nations, in saying these are some gaps for their forces in being able to address the violent extremist organizations on the road. Q. Speaking of violent extremists, how has your command responded to the attack in Niger? A. Certainly we are all concerned with respect to recent losses, and our thoughts and prayers are with the families and the wounded soldiers as well. We all recognize that this is an environment in which we are operating into to help improve stability on the continent itself. There are some unstable regions, and because of the instability that exists, we recognize that there are threats and challenges out there. Everyone that operates on that continent recognizes that that type of situation can exist there. Again, our objective is to focus on an ability to ensure that our host nations, our African Partner Nations, have an ability to address these threats and challenges themselves. Of course, one of our objectives ... is to ensure that we do, of course, have priority towards our force protection and protecting not only our personnel but also U.S. assets on the continent as well. Q. Why should the Army focus on Africa? A. Africa is an enduring interest to the United States, so it matters for a number of reasons — and it is not just us, but Europe as well. When you look at the instability that we see, that ... can impact the United States, our partners, Partner African Nations and, of course, allies as well. The security instability in Africa, combined with the youth bulge that is occurring on the continent itself, the lack of economic activities, lend themselves to tripling the number of African immigrants that we have seen crossing Mediterranean Europe in the last five years. So it is in our best interest to look at Africa, at not only these challenges but the opportunities that lie ahead for us. And that if we do not invest in Africa, if we do not help our African partner nations in building stability and building economies and strengthening democratic institutions, then it is going to be a much more difficult challenge in the future.